State Technical Univer sity, Petropavlovsk-Kamchatskij, Russia. 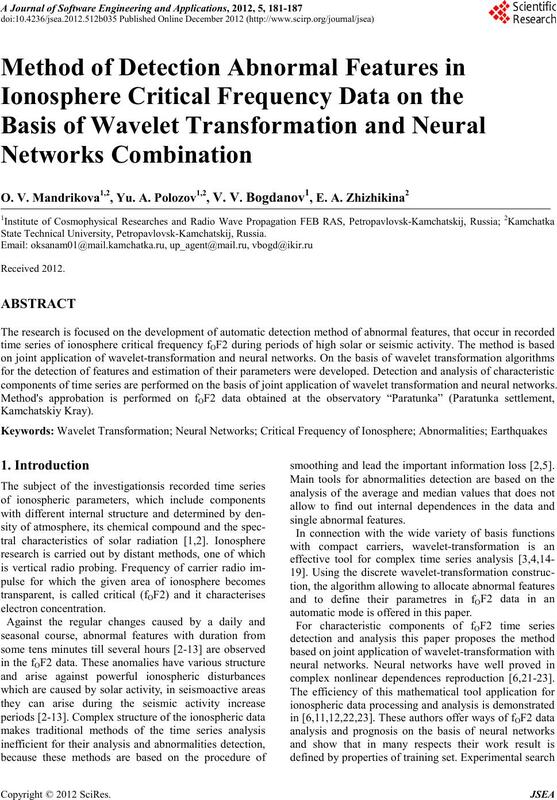 components of time series are performed on the basis of joint application of wavelet transformation and neural networks. smoothing and lead the important information loss [2,5]. automatic mode is offered in this paper. complex nonlinear dependences reproduction [6,21-23]. vectors depend ing on it s structure. limited by step of discrete tim e series sampling. , that allows to restore function completely. 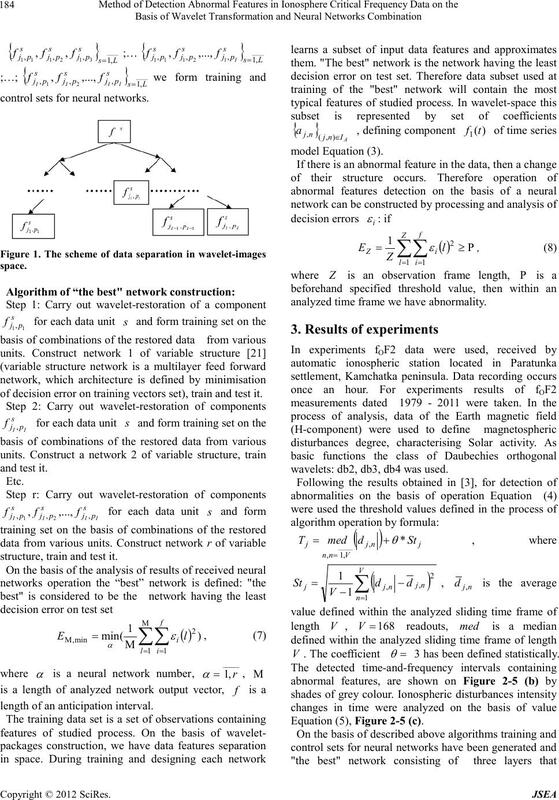 neural net works joint applicat ion. is length o f network input vector. 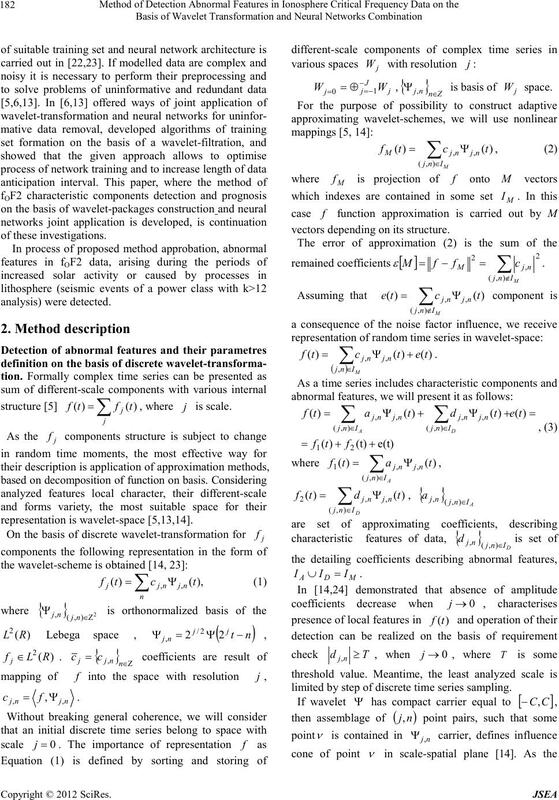 position on antic ipation interva l.
control sets for neural networks. 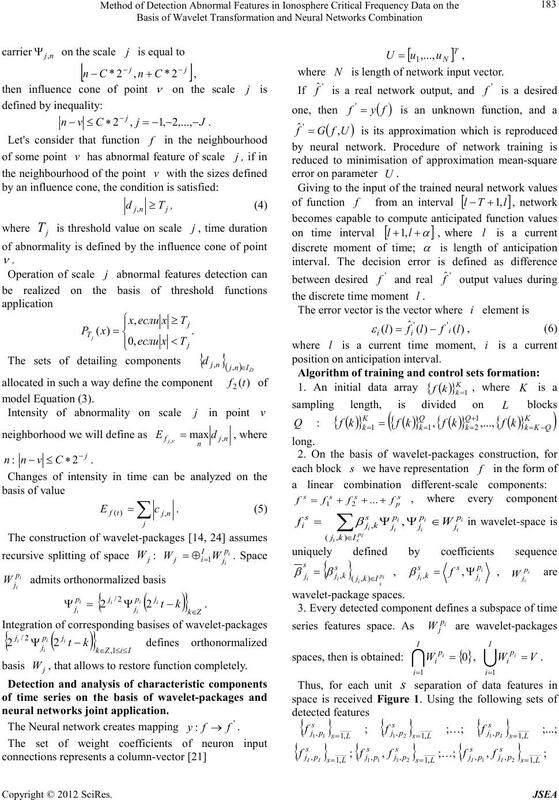 of decision error on training vectors set), tr a in and te st it. structure, tra in and test it. length of an anticipation inter val. model Equa tio n (3). analyzed time frame we have abnormality. 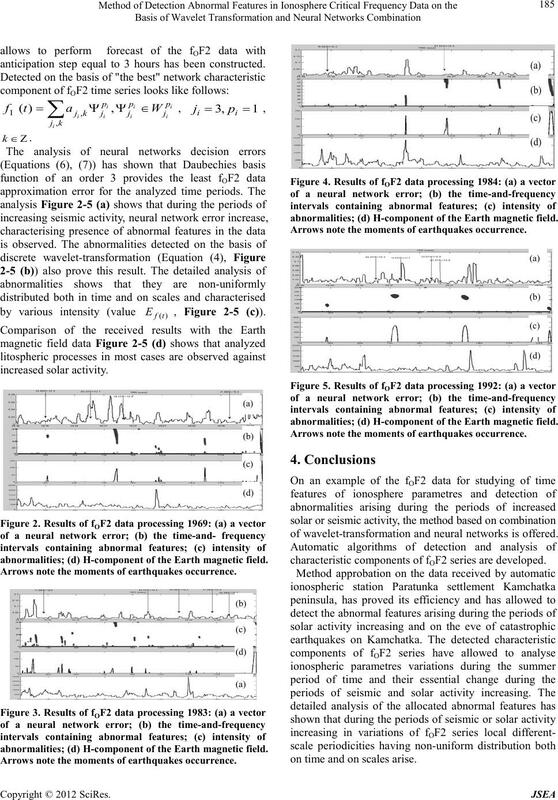 wavelets: db2, db3, db4 was used. 3 has been defined statistically. Equation (5), Fig ure 2 -5 (c). anticipation step equal to 3 hours has been constructed. abnormalities; (d) H-component of the Earth mag netic field. Arrows note the moments of earthquakes occurrence. abnormalities; (d) H-component of the Earth magnetic field. Ar rows note the moments of ea rt hquakes occ urrence. 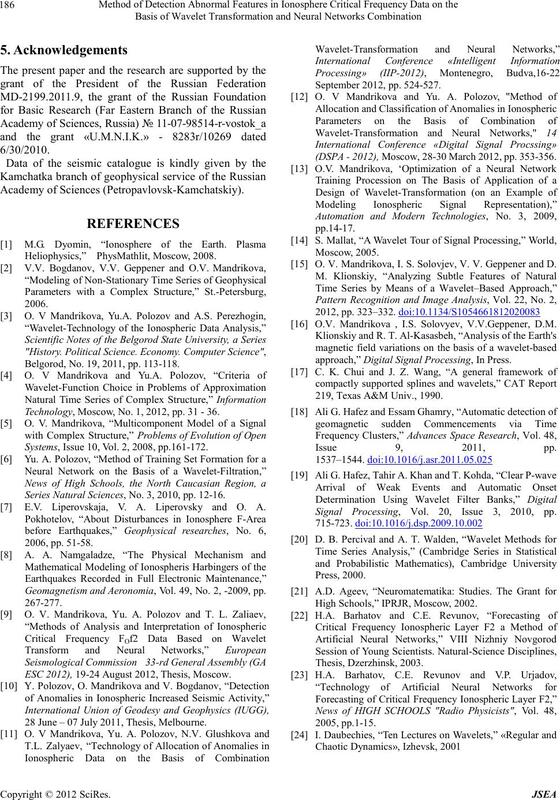 of wavelet-tra nsfor matio n and neural networ ks is o ffered. characteristic compone nts of fOF2 series are developed. on time and on scales arise. Belgorod, No. 19, 2011, pp. 113-11 8. Technology, Mos c ow, No. 1, 2012, pp. 31 - 36. Systems, Issue 10, Vol. 2, 2008, pp.161-172. Series Natural S ciences, No. 3, 2010, pp. 12-16. E.V. Liperovskaja, V. А. Liperovsky and O. A.
Geom agnetis m and A eronom ia, Vol. 49, No. 2, -2009, pp. ESC 2012), 19-24 August 2012, Thesis, Moscow. 28 June – 07 July 2011, Thesis, Melbourne. (DSPA - 2012), M osc ow , 28-30 M arch 2012, pp . 353-356. O. V. Mandrikova, I. S. Solovjev, V. V. Geppener and D.
 O.V. Mandrikova , I.S. Solovyev, V.V.Geppener, D.M. approach,” Digit al Si g nal Proces s ing, In Press. 219, Texas A&M Univ., 1990. Signal Processing, Vol. 20, Issue 3, 2010, pp. High Schools,” IPRJR, Moscow, 2002.